Mirabella Luxury Condos - Register for Platinum VIP Access! 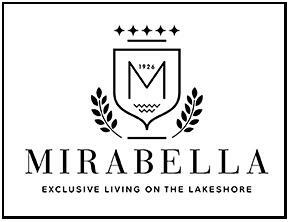 Mirabella Luxury Condos by Diamante Development Corporation is coming soon to the Swansea neighbourhood in Toronto, Ontario. It is a new high-rise condominium development located at Windermere Avenue and Lake Shore Boulevard West consisting of two 35 storey residential towers that are connected by a five-storey podium. Mirabella Condos is designed by Scott Shields Architects & Wayne Swardon, Interior Design: Stanley Kedzierski & Urban Parallel Interior Design + Planning. It will have a total of 760 proposed dwelling units. Mirabella Condos is situated in the Swansea Village which is "the only Toronto neighbourhood that has its own community run Town Hall". This area is extremely hilly in nature and is also the only neighbourhood in Toronto that has a pond, a river and a lake as it's natural boundaries. The Swansea community has many mature trees and winding roads that "accentuate the storybook houses that line the residential streets" and is primarily residential in nature. There is a mix of various housing types such as semi-detached and bungalow style homes built between 1905 and 1935 located centrally and high-end homes located at the western edge of the neighbourhood overlooking the Grenadier Pond. "Swansea has become a highly desirable part of Toronto in which to live". Mirabella is located close to Sunnyside, the Sunnyside Boardwalk and Sunnyside Park and is also situated south of Grenadier Pond. This development site is located south of the 400 acre municipal High Park which is Toronto's largest public park consisting of a "mixed recreational and natural park with sporting facilities, cultural facilities, educational facilities, gardens, playgrounds and a zoo". There are also many hiking trails and diverse vegetation with one third of the park remaining in its natural state. There are also playgrounds for kids, a park for dogs, picnic areas, greenhouses and various events throughout the year also takes place here. Rennie Park, Sir Casimir Gzowski Park and South Humber Park are all located close by. The Humber River is located to the west of the new proposed development and the Gardiner Expressway is located right by the Mirabella Exclusive Living On The Lakeshore. Register with us today for your Platinum VIP Access to the Mirabella Condos by Diamante Development Corporation!